Q: Doesn’t it cost a couple thousand dollars for a good website? A: That is what some website designers and companies want you to believe. The truth of the matter is that websites have come a long way. They are quicker and much more efficient. The cost to create and develop a site has come way down – some people just don’t want you to know that! Q. What happens after purchasing a website? A: That’s the easy part – let us know your option choices. We provide an easy setup form so our web team can get to work building your site. It lets us know important things like theme choice, contact information, photo options, domain name, and other items unique to your site. Q: Can I use different Photos? A: Yes! You can use the photos that are shown on the demo sites or you can select your own! Each sites comes with a single use license for the number of photos shown on the example sites and are purchased from depositphotos.com. If you want different photos just provide the photo id numbers from depositphotos.com during the setup process and we will use those instead. A: Hosting is where your site is actually housed. We build the site, but the files must be stored somewhere. The hosting cost covers the storage and the ongoing bandwidth needed for people to see your site. A. The initial purchase covers the website setup and first 12 months of hosting fees. You will have the annual cost of the domain name (approximately $12 per year) along with hosting fees (see next question below). A. The first 12 months of hosting are included with your website setup. After that you will be billed $59.70 every six months or $96 annually (a savings of 20%). If you check around on hosting plans you will find these rates are very competitive. You also have the ability to move the site to a different hosting service at any time (at your option and expense). A. Yes. Matter of fact, we are going to work with you to help you pick one out! Not only do you own the site, you will own the domain name as well. Q: How much does it cost for a domain name? A: Domain names are about $9.00 – $14.00 per year. We recommend Godaddy.com, which is currently $11.99 per year. You can also use NameCheap.com for a slightly lower cost. These costs are paid directly to the Domain registrar (GoDaddy, NameCheap, etc). This is very important as it means YOU stay in control of your domain name and site at all times. Q: Can you insert my company logo? A: Sure! Just send us a png or psd file of your existing logo and we will do the rest. We create a header with your company name and existing logo as part of Bonus Item #2. Keep in mind that most of the headers do not exceed 120 pixels wide. Q: What if I don’t have the png or psd logo files but want a custom header designed? A: We can do that for you as well. Most custom header designs are an additional $75. Let us know what you want and we can have our team of graphic artists provide proposals. Q: Can I make changes to the articles already on the site? A: Of course – they are yours to use as you wish! You can edit, delete, or modify them as you see fit. You can even put yourself as the author! You can also add new articles using the built-in WordPress publishing feature. Q: What if I need to change something? A: You will have complete access to your site including admin panels. You will also receive free access to online WordPress training videos on how to use and update your site. You can make changes on your own or hire us to do them for you. Q: What is “WordPress” and why is it important? A: WordPress is an open source publishing platform and blogging tool powered by PHP and MySQL. It is often customized into a content management system (CMS). It has many features including a plug-in architecture and a template system. WordPress is used by over 14.7% of Alexa Internet’s “top 1 million” websites and as of August 2011 powers 22% of all new websites. In other words…it is a solid industry standard. It is considered one of the most user friendly and search engine friendly platforms available today! Q: What is SEO and will my site have it? A: SEO stands for “Search Engine Optimization” and yes, you want it. It is how search engines like Google and Bing can help people find you. All of our sites are SEO optimized from the very beginning! You can also optimize for additional keywords and improve your rankings by publishing new articles with the convenient blog feature. Q: Will the site have a blog feature? A: Yes, each site has a blog feature should you choose to publish new articles or posts. This is currently shown on each demo site under the menu tab titled “Articles”. If you prefer to call it a “Blog” let us know during setup and we can change the title on the Menu. Whatever you decide to name it the feature works the same way! Q: How will people contact me? A: Every one of the site choices has a contact us page and form on it. This contact us page will be updated to show your contact information during the setup process. In addition to contacting you, people can choose to fill out an entire worksheet and submit it online! The worksheet is also available for download in PDF format on the Quote Request page. Q: What if some time later I want to change the look of my site? A: Like we said, you own the site. It is yours to do with whatever you like. You can add cash flows, change the look, or modify to fit your needs. If you need help, you can contact us for a quote to make any design changes. Q: What is mobile responsive web design? A: Mobile devices (like smart phones and tablets) have smaller screens than desktop computers and laptops. A mobile responsive web site will adjust how pages are viewed based on the screen size of the device used by the visitor. A fixed width site does not change the layout so a mobile device might need to scroll or zoom in to view certain portions of the site. 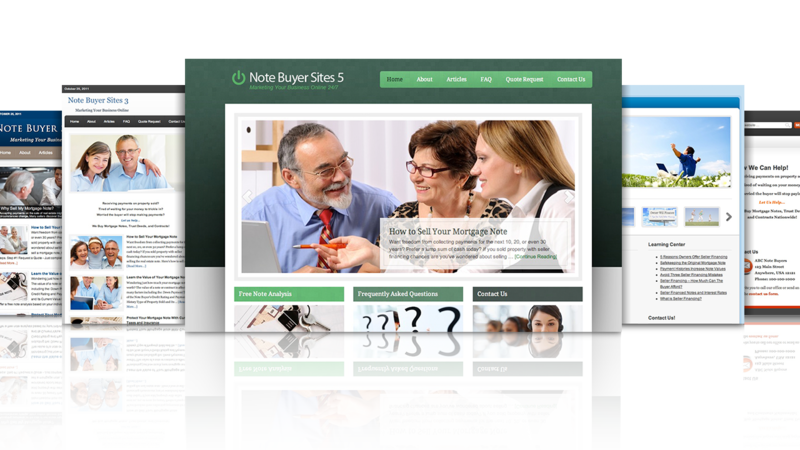 With Note Buyer Sites you have options! Themes 1 through 5 use fixed width design while themes 6 and higher use the latest in mobile responsive technology. If you want to see any of these website demos in action just visit from both a desktop and a mobile phone. A: Just send us an email to [email protected] or call us at 1-888-999-7905 and we will be happy to answer any additional questions you might have!